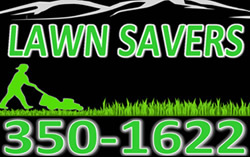 Lawn Savers Offers Landscape and Design Services to meet any budget or imagination. Whether you need a new lawn installed and landscaping for your new construction home, or just want to give your outdoor space a facelift we offer something for everyone. Whether you need a couple yards of topsoil dropped off for your garden or 200 yards delivered, spread, and rolled in preparation for a new lawn we can tackle and job small or large. Does your outdoor space need a makeover or, have you just bought a home that needs the initial landscaping installed? Lawn Savers will walk you through every step necessary to provide you with the outdoor space you have dreamed of. Whether you want a new rock garden bed installed or 100 shrubs and trees planted to line your property and provide you with a natural privacy fence. Call us TODAY and receive your free consultation of providing you with the outdoor space of your dreams. Hydroseed is the combination of seed fertilizer, water and fiber mulch. This mixture also called a slurry, is mixed in a tank and sprayed on the area new grass is needed. The mulch in the mixture allows the seed to be protected from birds and retains the moisture around the seed shell for optimum germination results. Hydroseed is the best and most efficient option for installing a new lawn or patching large areas in an existing lawn.